The hooked, beak-like jaws give this turtle its common name. The generic name, Eretmochplys, means "oar turtle," from the way it swims, and the specific name, imbricata, means "overlapping" because the shields on the carapace overlap like tiles on a roof. The hawksbill is one of the smaller sea turtles, Hawksbills usually range from 30 to 36 inches in length and weigh 100 to 200 pounds. The record is 280 pounds. The thin shields overlaying the bones of the carapace, also known as "tortoise shell," are beautifully marked with amber and reddish tones with shadings to yellow, white, black and green. The plastron is whitish-yellow, occasionally with a few black splotches. The young tend to be black to brownish-black, with touches of light brown. The body has an elongated oval shape; the head is quite narrow. 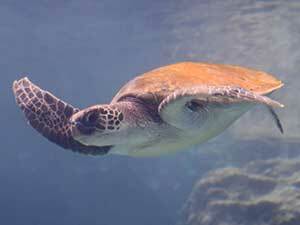 As with green turtles, there are four pairs of costal shields on each side of the central plates on the carapace. The shields overlap, with the exposed edges rough and serrated. The limbs usually bear two claws. The endangered hawksbill has been hunted to the brink of extinction for its beautiful shell, which are used to make jewelry and other products.. Once relatively common in Florida, these turtles now nest here only rarely. 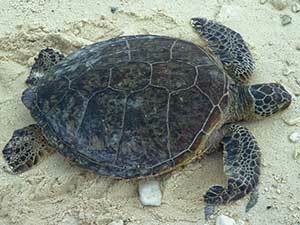 Hawksbills feed on sponges and other invertebrates and tend to nest on small, isolated beaches. Hawksbill turtles nest from April through November in Mexico, the West Indies and the Caribbean coast of South and Central America. 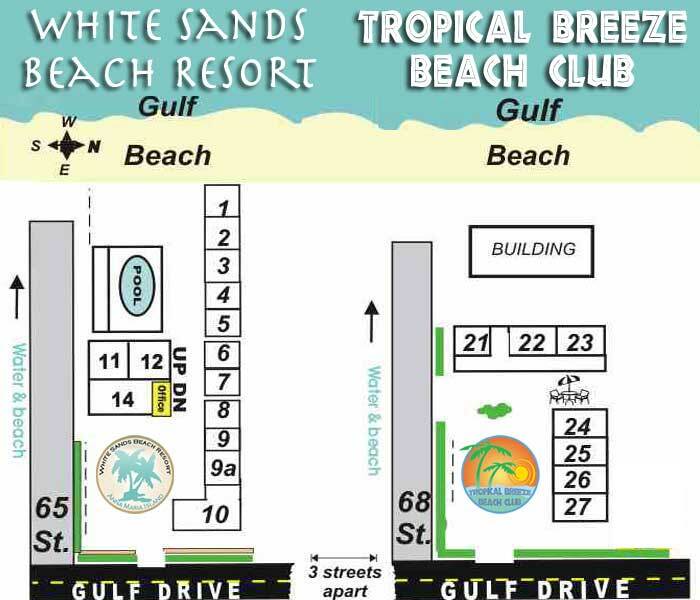 Occasional nests are found on Florida beaches. In recent times a few nests have been documented in the Keys, in Palm Beach and Martin counties and at the Canaveral National Seashore, and south of Port Everglades. Although they are found in U.S. waters, they rarely nest in North America. 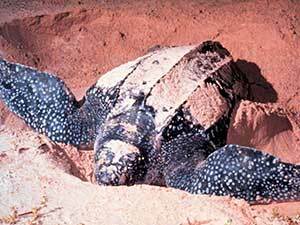 Hawksbill turtles nest at intervals of 2, 3, or more years. An average of 2 to 4 egg clutches are laid approximately 15 days apart during nesting season. An average of 160 eggs per clutch are laid and they incubate for approximately 60 days. Although they nest on beaches throughout the Caribbean, they are no longer found anywhere in large numbers. Hawksbills are reported to eat a wide variety of invertebrates, but the predominate food item in most parts of the world appears to be toxic sponges. This is a very unusual diet because the sponges are made up largely of tiny, grass like needles. 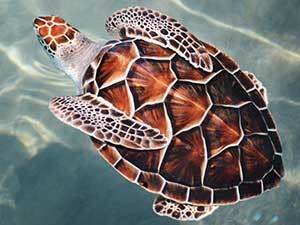 No adaptations have been discovered that would explain how a hawksbill turtle can Even on this diet. The tiny needles are routinely found embedded in the walls of the intestines but appear to cause no harm. In some parts of the world, hawksbill turtle meat is reported to cause food poisoning in humans because of the toxic sponges they consume. The hawksbill may be the most tropical of all marine turtles. Although they occasionally stray into colder water, hawksbills usually are found in coastal reefs, bays, estuaries and lagoons of the tropical and subtropical Atlantic, Pacific and Indian oceans. nesting in Florida, Mexico, the West Indies and the Caribbean coast and islands of Central and South America. 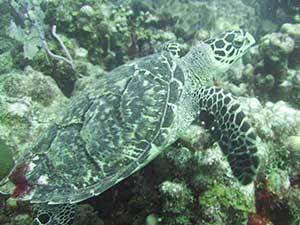 Hawksbill turtles are observed regularly by scuba divers on reefs off the Atlantic coast of Florida and in the Florida Keys and may be more common in these coastal waters than previously thought. Hawksbills can climb over reefs, rocks and rubble to nest among the roots of vegetation on beaches that would be inaccessible to larger, less agile sea turtles. Small, isolated beaches, often on offshore islands, are favored nest sites. Most nesting is by solitary females on scattered islands and shores but this may be because populations have been reduced.